Now that my husband and I have re-entered “the real world,” B-school seems like a lifetime ago. 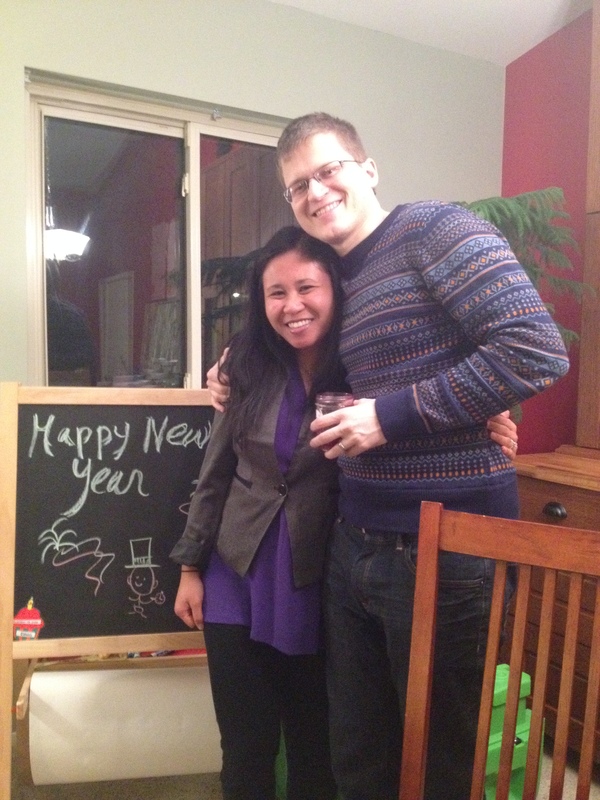 We celebrated many milestones over the past few months: Michal’s graduation, moving to a new country and me turning 30. As we are finally getting settled into our new home, I thought I’d revisit and reflect on my 30 before 30 blog post. I was pretty busy in the last semester of living in Charlottesville! Work – The online PR classes I took at U.Va. were not only helpful but also extremely fascinating. I most benefited from the online discussion forums that allowed me to interact with PR professionals all over the country and internationally. As the Communications Assistant at the Women’s Center, the coursework on crisis management was most helpful during the media blitz surrounding sexual assault on the Grounds of University of Virginia spurred by a controversial (now retracted) Rolling Stone article. Just looking back at this moment makes my heart ache a little. I never expected to get so close to our friends at Darden and within the Darden Partners Association, but it was inevitable with how much time we all spent together (especially with the partners over the summer while the business students were away on internships). I can be candid now and admit that I remember crying off and on for a few days after graduation, unwilling to believe that the B-school experience was really over. As you can tell, this part of the list didn’t get as much love. After living out of a car for a couple months and then spending time with family and friends back in our hometowns in Michigan, there just wasn’t much downtime to work on scrapbooks and crafts. Farewell America Tour – Starting from Virginia and ending in Vegas, we took almost two months to travel on our cross country road trip to say goodbye to friends and family as well as check out sites of the U.S. we didn’t want to forget or had yet to explore. States we visited: North Carolina (during Beach Week, the time between end of final exams and graduation), West Virginia, Kentucky, Indiana, Illinois, Iowa, Nebraska, Missouri, Kansas, Colorado (spending the most time here, as we camped/hiked all over the state for a solid week), Utah, Arizona, Nevada and eventually (on a pit stop before Asia) California. It was incredible, as we often found gems in the rough. (Who knew there was an artsy and hipster scene in Des Moines?) And we truly discovered how much America has to offer. We even felt that we didn’t have enough time to explore everything we had on our original itinerary (e.g. more national parks). There are too many photos from this trip, but everything is documented on my Instagram. One of my favorite times was when we did our Pacific Coast Highway road trip through California – On our four-year wedding anniversary, we stopped in scenic, romantic Morro Bay. No place like home – While we were back in our hometowns in Michigan, we had major events every week like immediate family birthdays, a friend’s wedding, a Yelp Elite event in Detroit, a going away party for us, and even a surprise 30th birthday party for me! Almost everyday was also a special dinner dedicated to saying goodbye to someone near and dear to our hearts. The month we spent in the Mitten State went by in such a flash that I didn’t adequately have time to process these goodbyes. But I do look back at that time fondly and I am so grateful we had quality time with each of them. 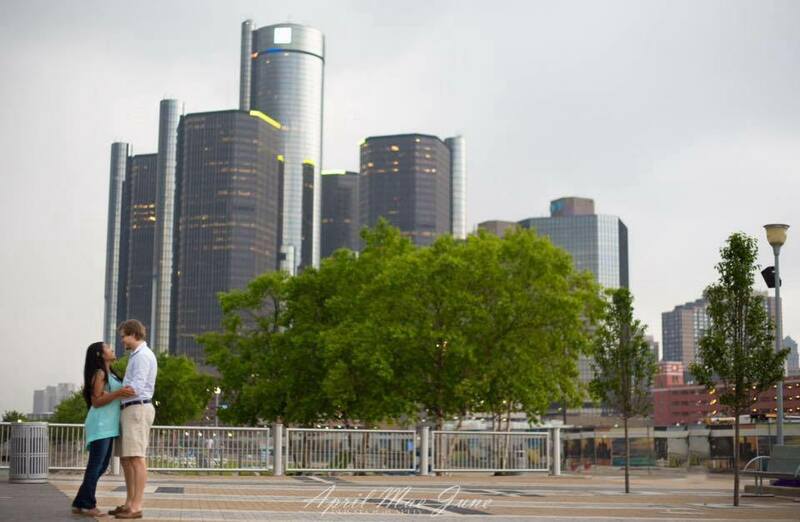 Below is a pic that my photographer cousin took for us at the Detroit Riverfront as a parting memento. Find out more about her work on her website: April Mae June Photography. En route to Seoul, Michal and I made the aforementioned pit stop through California so we could do a short road trip from San Diego up to San Fran (lasting one week). We then flew to the Philippines and spent two weeks in a tropical paradise, as well as visited the rural countryside of my parents’ upbringing, before eventually landing in Seoul in mid-August. Asian Adventures – We spent a few days in beautiful Palawan island on a beach resort near the mountains. I absolutely loved bathing in warm water, catching the waves and basking in the sun. Even though it was the rainy season, we still caught pockets of sunshine throughout the day. There were few people due to the low season, which we relished because of the extra attention and space. We then joined my parents and brother, who were already visiting in the Philippines. I am quite Americanized, as my parents never taught me Tagalog growing up in the U.S. and it had been about 15 years since I last visited their native country, so everything seemed new and exotic. We visited my dad’s relatives in hotter back-country of Pangasinan: We explored my grandfather’s coconut and mango plantations; ate traditional feasts comprised of the animals raised on the farm like chicken, goat and duck; and rode around town on the infamous tricycles. We also visited my mom’s relatives in the more urban Baguio City: We went dancing with my cousins at a new club, toured the Philippine Military Academy, and enjoyed the cooler weather in the mountains. Through this experience and the rest of the time I spent with them this summer, I felt much more close to my parents than I felt in a long time. And in the four years of marriage (plus five years of dating/engagement beforehand) that Michal knew them, he finally got to truly know my parents. Below is a pic from my favorite time with my family in the Philippines. We are on Governor’s Island within 100 Islands National Park in my dad’s province, Pangasinan. Starting over in Seoul – I’m quite a worry wart. When moving, I experienced the same anxiety I had when going to Charlottesville for B-school: Will I make friends? What will I do for work? How much will I actually see my husband with his new schedule? Thankfully, the expat community is quite large in Seoul. As soon as I got here, I signed up for MeetUp group outings, as well as joined a Korean language class with the spouses of my husband’s co-workers. The support system I’m building/finding here is reassuring. It’s really feeling like an extension of the B-school experience in a way because of the expat bubble. However, “homesickness” is unavoidable for me. I put it in quotes because I’m not quite missing the place but the people. It is really hard to imagine that anything will come close to the time we had at Darden. Friends from the DPA created GroupMe conversation threads and we still text each other often. Take every opportunity to get involved and make connections. These could be life-long friendships you’re making, and the Darden community is strong and wide-reaching. There is even an alumni network here in Seoul! This past weekend we got the most amount of snow I’ve seen in Charlottesville all winter and not many were out on Saturday, but Michal’s four-wheel drive did well on the roads so we thought we’d try out a Living Social deal we found for a flotation center near the Downtown Mall. Aqua Float is a totally different kind of spa or wellness center than Michal and I have ever visited – more focused on individual meditation and healing rather than a social experience we could share with each other and friends. We spent 90 minutes in individual rooms within enclosed tanks, each boasting more than 800 pounds of saltwater with a little ambient lighting. When I first saw our individual tanks, they reminded me of that moment when Matt Damon woke up in the film Interstellar. It looks like a space ship or a device from some sci-fi, futuristic film. I need to be extra careful not to accidentally rub my eyes with salt as it will burn. I will probably get bored, but this is supposed to be healing so I’m going with the flow. I fell asleep half-way through and woke up with a start as it took me a minute to re-orient myself. I also started to feel a bit claustrophobic so I opened the lid of tank a bit. I was incredibly thirsty – downing two water bottles immediately. After showering off all the salt, my skin felt amazingly smooth and I was glowing. When Michal and I met up in the lounge, we helped ourselves to complimentary fruit, lemon-infused water and tea while reading a few materials on the benefits of floating, as well as journaling/doodling. This time helped with extending the relaxation experience and alleviated my dehydration. I felt a boost in my mood and energy level that lasted me through the day. Probably not unless there is another LivingSocial deal – We paid $29 each for what normally costs $60 each. Also – the length of the session seemed a bit too long to me as I did get a bit stir-crazy in that tank. However, I like finding unique, local spots like this and will now consider doing my Epsom salt baths at home as I love the way my skin feels afterward. This was also a very calming, restorative experience that I would recommend if you’re having a stressful or anxious week, as it truly helped me to quiet my mind. 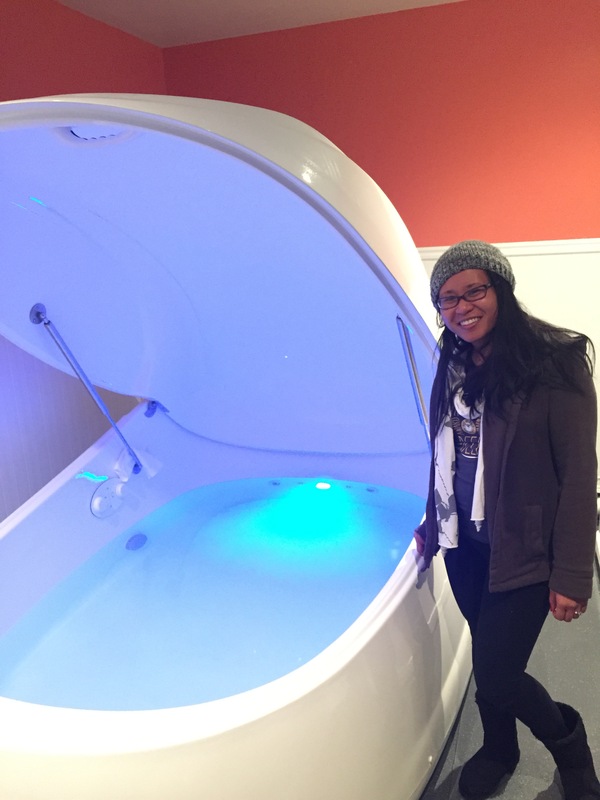 Have you ever tried a floatation center or are you interested? The employees at the one we visited in Charlottesville told us the majority in the U.S. are out on the West Coast. 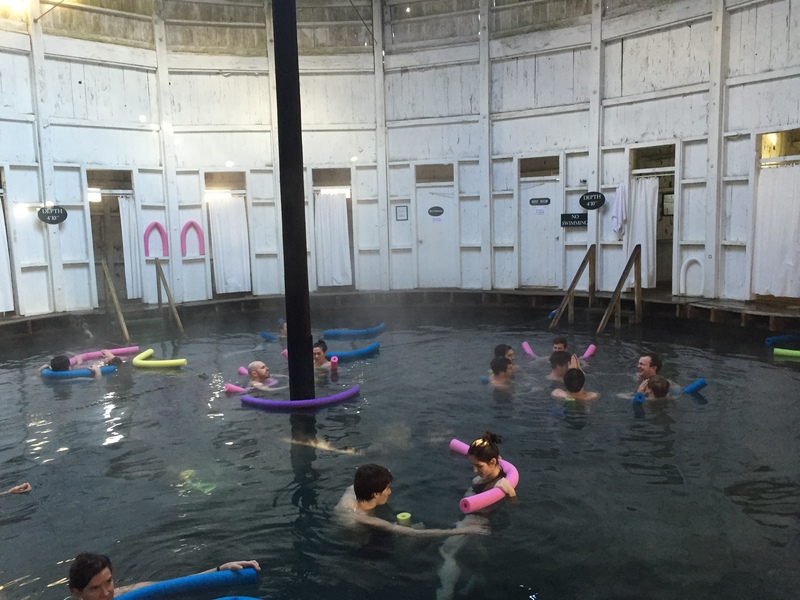 In my quest to complete my Cville Bucket List in our second and final year at Darden, my husband Michal and I have discovered a few spots in Central Virginia that are a fun alternative to the typical Jacuzzi, whirpool or hot tub in a ski lodge: the Omni Homestead and Jefferson Pools. Less than two hours away from Charlottesville, these two facilities have the same owner (Omni) but drastically different feels – swanky vs. rustic. The following is recap of a Saturday-Sunday trip that Michal and I took last month when we decided to “take to the waters,” in Thomas Jefferson’s words. 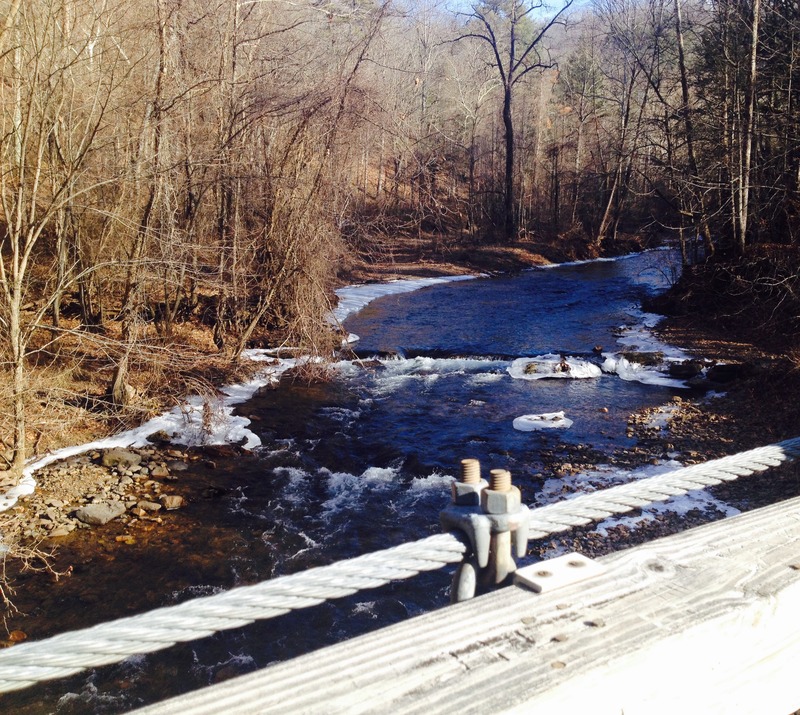 This hike is known for the views on its long walking bridges. The weather and scenery that day make this photo seem like it was during the fall season! Our legs were ready for some relaxation, so we checked into the Warm Springs Inn. The inn was cozy and had a lot of character with the main building’s beautiful architectural details, as it used to be a courthouse and jail in 1802. Bonus: The inn was lot more affordable of $96/night instead of $180/night or more at the Omni Homestead down the road. It felt like we time traveled to Thomas Jefferson’s era – except for the floating neon-colored noodles we used. Although the Jefferson Pools were charming with its history, it seems they haven’t renovated since that time period. The surrounding walkways and parking lot were muddy after melted snow and rain and no pavement, and the building itself was a rickety wood dome with a “skylight” that looked like a clear plastic tarp that had a rip in it. Not to mention, there were no working public bathrooms or insulation for the dressing rooms. Expert advice: Based on suggestions from the innkeeper across the street, I planned ahead and wore bathing suit underneath my clothes to minimize the amount of time it took to get into the water. The water was just above body temperature, so they’re not as hot as the springs at the Homestead but the co-ed pool was much bigger so I didn’t feel claustrophobic. Plus, they provided noodles to help with floating and it was deep and wide enough that I could swim or tread water a bit when it wasn’t busy. For $17 to soak as long as you want, it wasn’t too expensive, but it really should have had a discount as the more upscale Homestead was similarly priced at the time we went. After freshening up at the inn across the street (again – I must emphasize the convenient location because you’ll then limit the amount of time you’re out of the pools in an unheated environment!) we were starving and ready for dinner at The Waterwheel. We loved this place for the combination of big city-standard gourmet food with the hospitality and modesty of the countryside. My fav dishes were the savory Oyster-Stuffed Mushrooms, fresh Highland County Mountain Trout (sourced only a few minutes away) and the fluffy Sour Cream Maple Syrup Cake. Best part of dinner: Checking out the wine cellar in lieu of ordering off of a wine menu, where you can take your time to select your own bottle! We scored one for $27 – an incredible steal for a good quality red. We both got fish for dinner – salmon and trout. Both were yummy but I’ll never forget that bottle of wine! After church the following day, Michal and I enjoyed the Homestead Spa for its luxurious and plentiful amenities with the indoor Aqua Thermal Suite and the outdoor Spa Garden. Pano view of the Spa Garden that includes the natural warm and hot springs – early on a Sunday before the crowds. The Aqua Thermal Suite was separated between the males and females so we each took some time on our own to explore these saunas and showers. And the bright tile colors, rushing water sounds and floating scents of lavender or eucalyptus appealed to all my senses. After some quality alone time, we met in the co-ed, very family friendly indoor pool for a few laps (needed to get our workout in for the day). And then we rested in the co-ed lounge while filling up on some complimentary tea and fruit, along with some yummy turkey croissant sandwiches we purchased at the cafe. After this sustenance and some magazine reading while snuggled up in blankets, we ventured outdoors. There were two springs – hot and warm. The warm one was a little murky for my liking, but it at least felt very natural/authentic. The hot one was the perfect temp for me, but was a bit small so it got crowded at points. Out here, the majority of people were our age or slightly older and mostly seemed to be couples. Expert advice: There was a co-ed sauna nearby that employees recommended we leave our towels and robes so that they stayed warm. 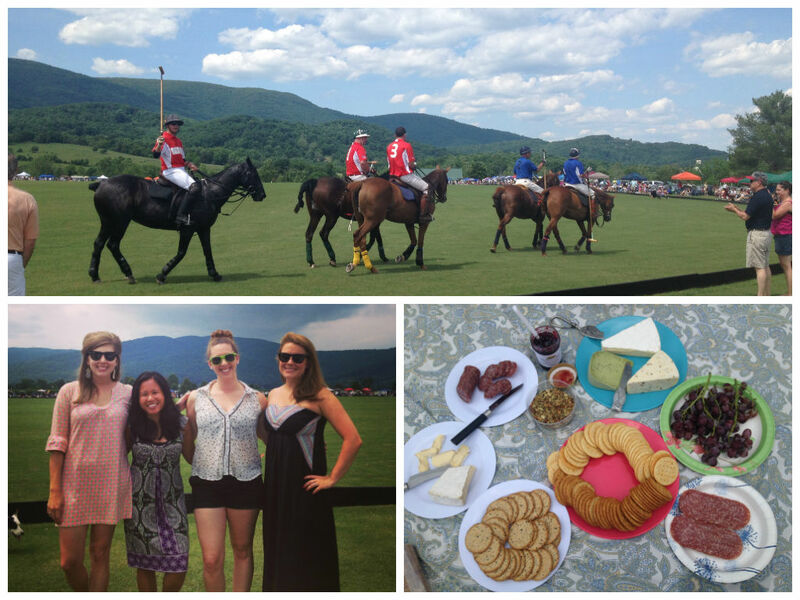 This trip was the perfect weekend getaway, as the drive wasn’t too far from Charlottesville but far enough that we got to experience something adventurous. Going to the springs is the best recovery activity after hitting the ski slopes or trekking through mountainous terrain. Not to mention, the overall price tag (especially during the winter season) makes the trip affordable for grad students on a budget looking for a little adventure. Go during the winter season to maximize discounts. Michal and I have actually checked out a range of spas and saunas from Korean King Spa & Sauna when we lived in Chicago suburbs to the historic baths of Budapest and thermal springs of Costa Rica during our summer vacations. Are there any natural spas in the world that you recommend we visit? When your significant other/student goes on a “Study Abroad” type of experience through Darden, (Global Business Experience, Global Field Experience, a club-sponsored conference, an exchange program, etc. ), consider taking the opportunity (if your schedule and finances align) to join him or her for a time – either before it starts, after it ends, and/or during part of the time the trip takes place if possible. 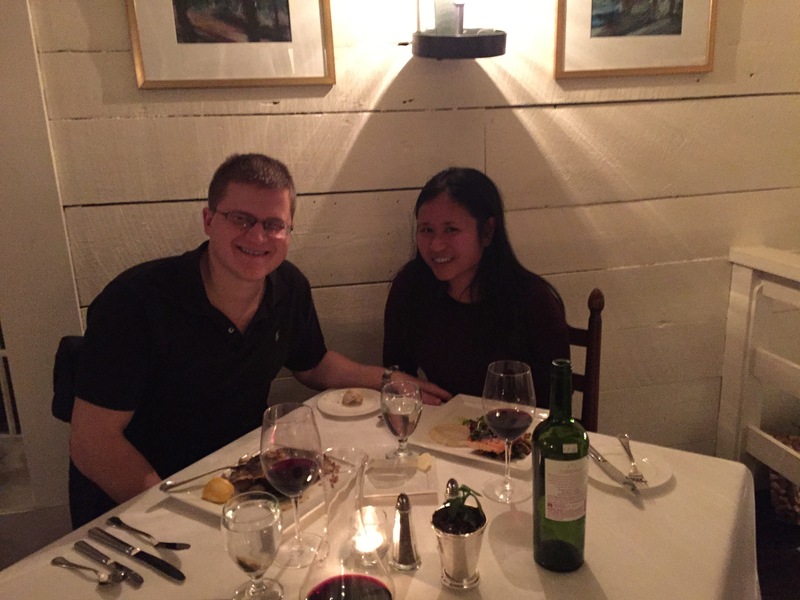 I joined my husband Michal during his GFE last semester, and I couldn’t have been more grateful. At the end of spring semester of Michal’s first year at Darden, back in May, I couldn’t join Michal during his Israel GBE because it would have been too expensive for both of us to travel there, and his overall schedule did not allow much free time for us to be together anyway. It should be noted that the Israel GBE was an incredible opportunity for Michal, as it included a mix of cultural, business and classroom settings. Read more about Michal’s Israel GBE class here. At the beginning of fall semester of Michal’s second year at Darden, back in August, Michal applied to more of these types of courses. One in particular stood out: a GFE in London and South Africa that was a consulting project for a Nigerian-based company. The trip occurred partially during Thanksgiving Break, and the company provided a travel stipend for Darden students in exchange for their work. With the ease of some of the financial burden of the trip and the timing during a period I would have been given holiday off of work any way, I couldn’t help but join Michal on his second global experience with Darden. 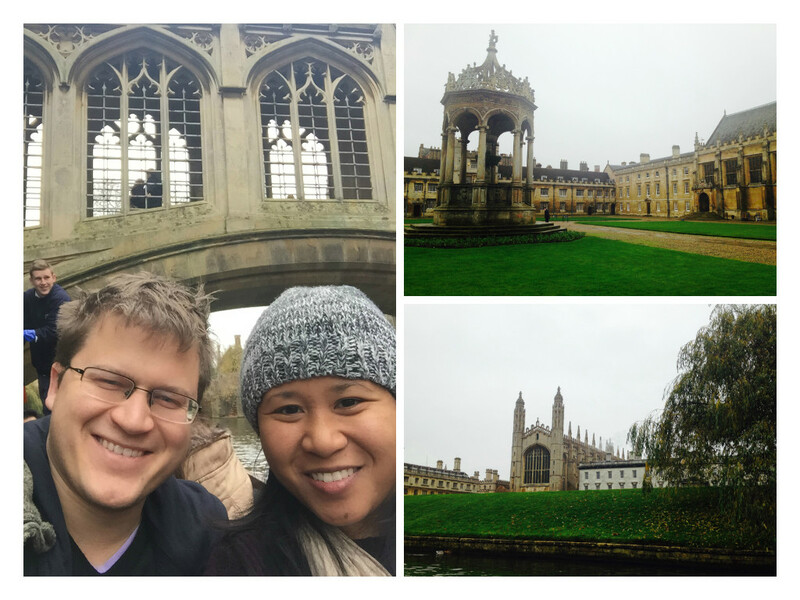 Michal and I enjoyed being able to walk everywhere: We toured all the well-known colleges of Cambridge – Trinity, St. John’s and King’s College. We punted down the River Cam so we could get a view of the Backs, and we even attended a choir concert at King’s College Chapel. Almost every moment felt like I was on the set of a Harry Potter movie. 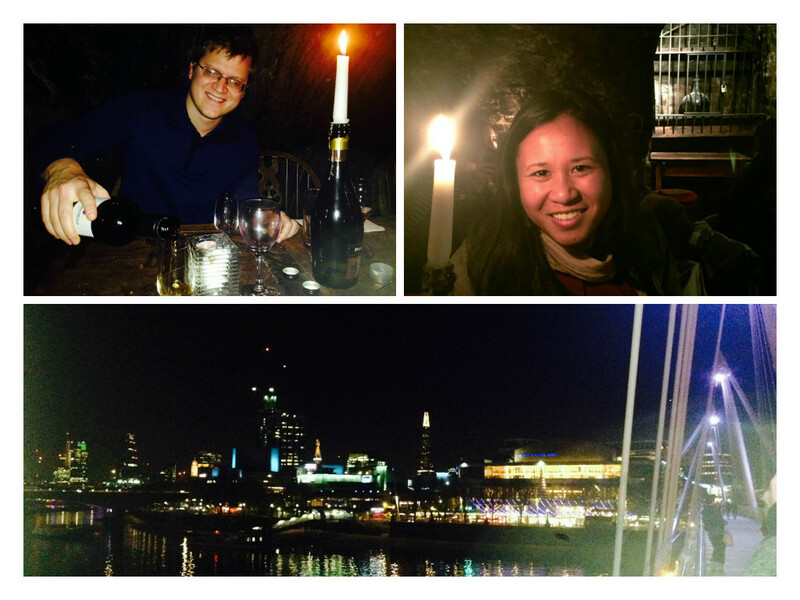 After our jaunt in this quaint university town, we jumped into big city life in London with zest. We stayed at a little townhome-turned-hotel in the South Kensington neighborhood near Imperial College, where Michal would spend his time during office hours on his consulting project. While he worked all day, I visited nearby museums. Our British friends, who we met back at Darden, recommended all the best restaurants and nightlife in London, along with provided some tips on how to maneuver through all the tourist traps. Of course, we ended up in the rain in front of Buckingham Palace and saw the Crown Jewels at the Tower of London. Michal ended up going on to the South Africa leg of the trip without me, while I spent a little more time on London on my own before making my way back to the U.S., as it was cheaper to do a round ticket for me. Until that point, I had never explored a foreign city or traveled that much on my own. In total, I spent about a week in London, with the majority of the time by myself. I’m so glad I took the chance of joining Michal on this experience because this adventure was like the Study Abroad that I ended up never doing while I was in undergrad. A more organized, prepared and polished crew this time around. 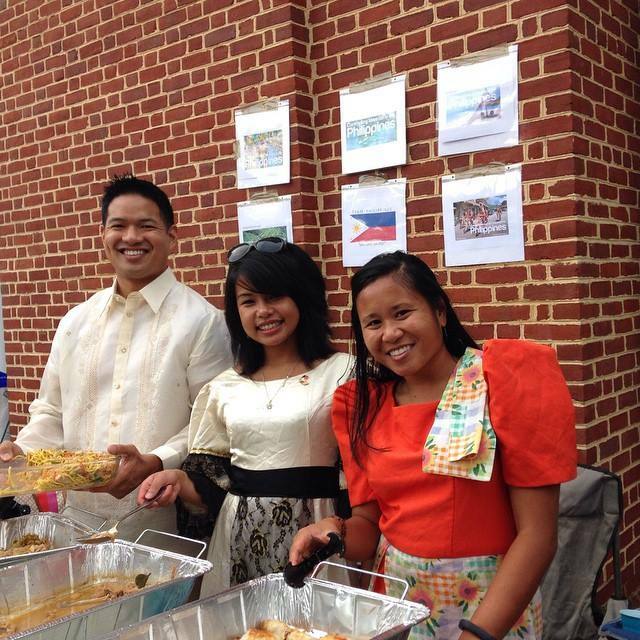 We improved our lumpia, adobo and pancit recipes, along with our clothing and decor, from the prior year and felt much more confident and united this time! Team Philippines reunited in SY for the Darden International Food Festival to not just attempt to defend our 2013 title, but more so to learn from last year’s (in)experience and embrace our heritage with more confidence. Perhaps participating in the IFF held more meaning for me this year, as my time in Charlottesville has been the most distance and time away I’ve had from my immediate family in my adult life. With determination, I re-made the dish I vowed never to make again last year after enduring the meticulous process. I ditched the Allrecipes.com instructions and tried to go more traditional from the filling (no potato this year!) to the wrapper (explicitly labled “lumpia” not “spring roll” paper). After a few batches, I came up with the following tried and true recipe for lumpia (AKA Filipino-style egg rolls). ~ 30 lumpia wrappers (28 came in the package I found) -> Make sure to go to an oriental market and find “Filipino lumpia” wrappers not “spring roll” or “egg roll” wrappers in order to get the right crisp, papery texture. Lumpia traditionally goes with sweet-chili sauce -> Find a bottle of this in an oriental market as well. 1) Coat a wok on medium-high to high heat with a tablespoon of oil. Break up and brown pork, stirring often and cooking until no pink shows. Remove pork from pan and set aside. Drain the grease from the pan, leaving a thin coating. Cook down the white onions, along with fresh garlic, for a couple minutes until white onions are soft and translucent. Stir in the carrots and green cabbage and cook for another couple minutes so that they wilt and meld with the onion and garlic. Stir in the green onion. Finally, add back the cooked pork. Season with soy sauce, pepper and garlic salt. Once the mixture is well-combined and the seasoning is distributed, set aside so that it will be cool enough to handle. Stir in the beaten egg to hold the mixture together and maintain consistency. 2) Place about one and half heaping tablespoons of filling onto the edge of the lumpia wrapper. Roll tightly to the thickness of a cigar. Wet the sides with the egg white mixture. Fold in the edges and roll over with the crease side down to seal it all in. Check out this Youtube video that shows you how to wrap it. Frying method: (w/o deep fryer) Heat deep skillet over medium heat, add 1/2 in. oil and let it heat up for five minutes. Put four to six lumpia in the skillet at a time – however much the skillet can hold with some room around each one. Fry one to two minutes, turning when necessary, so all sides are a golden brown. Baking method: (easier for larger quantities, slightly healthier) Grease a baking sheet and place lumpia with the crease down in rows with room around each. Brush oil over the top and sides to ensure crispiness and a golden brown color. Place baking sheet in a pre-heated 400-degree oven for 10 minutes. Then, take the sheet out and carefully, using tongs, flip the lumpia over to the other side. Bake again for another five minutes until evenly cooked. 4) Let sit for five minutes to drain on a paper towel and cool slightly. Make sure to cut in half before serving (to let the hot steam out so it doesn’t burn your tongue). Add green onion as garnish and the dipping sauce on the side. This is best served immediately to fully experience the crispiness! P.S. You can freeze your pre-formed lumpia and cook them later, if you so desire to portion out the servings. This dish is a little piece of my childhood that my mother still cooks for me when I come home to Michigan. For the ultimate Filipino feast, fit for a special occasion, don’t forget the pancit (noodles are meant to be eaten on your birthday to represent a “long life” you’ll live) and the lechon (whole, roasted pig) as pictured below from my dad’s uncle’s recent birthday party. My dad is one of 17 so we have a lot of extended family. Many of them happen to reside in nearby Norfolk and Virginia Beach. 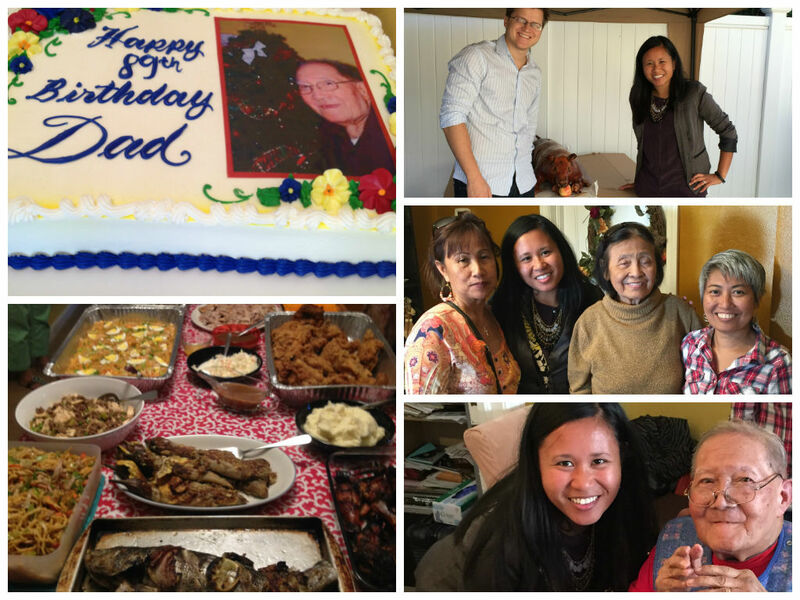 I was so grateful to spend time with relatives at this special party in honor of my dad’s uncle’s 89th birthday. Even though the summer season officially ends on September 20, the school year has already started. This means my social calendar has shifted to events mostly related to Darden. This was my favorite summer gathering place in Cville. The above pictures are from the last weekend of summer before my husband came back from his internship. At the end of matches, the players ride the horses close to the crowd for pictures and to meet people. A convenient wine cart comes around so I don’t always have to go back to the tasting room. It can get extremely hot if our group doesn’t have a pop-up tent for shade. Depending on where we’ve sat on the field, the bathrooms can be far away, and they are very limited. 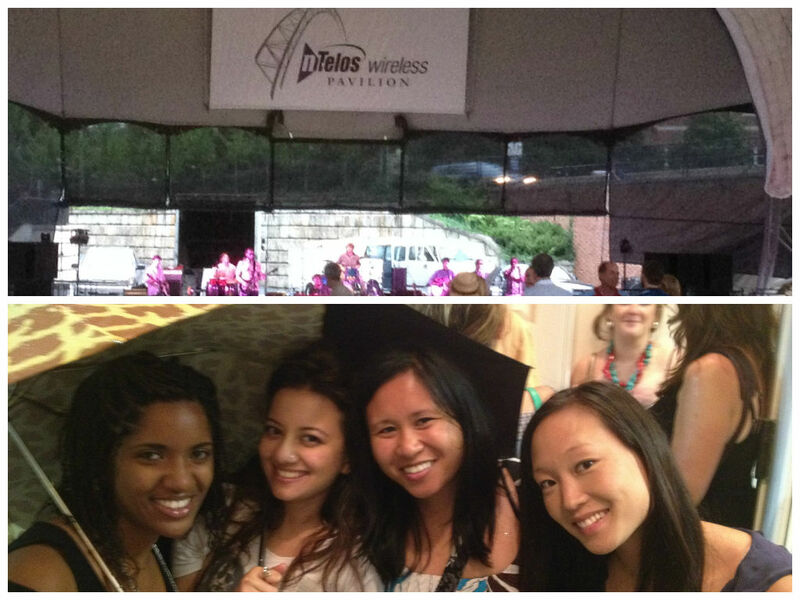 My co-workers and I liked to go to this event as an alternative to the usual Happy Hour, as it happened right after work at the end of the week. Above photo is when we got caught in the rain. We can bring our own food for a picnic, but there are also some food trucks on-site, and of course, nearby bars and restaurants on the Downtown Mall for either dinner beforehand or afterward. There are a variety of seating choices: table and chairs, folding chairs, or on a grassy area with a blanket or chairs that we bring. It’s a very short drive with the location that’s right in the city. Parking can be a pain. I try to park for free on the street, which tends to be on Monticello Road – It’s a bit of a walk but worth the savings in money. Try to get to the area before 5:30 p.m. if possible to score free spots. It can get very crowded, which means the grassy area also gets occupied fairly quickly. The music is oftentimes a bit too loud for me, as I prefer it to be more background noise to conversation. Kind of annoying that I couldn’t just buy a drink directly from the vendor. Plus: You can’t use leftover drink tickets on another night – So purchase wisely! The first photo is in the tasting room. The second photo is when my friend Esther visited from Michigan, and we took a walk through the vineyards on a trail she discovered just before the sunset. I can bring my own food or I could purchase a nice sit-down dinner. Although I never took the second option, I’ve known those who have who liked what they ate, and the dining area is a bit fancier. There are plenty of bathrooms – Porta Potties scattered throughout the area and restrooms in the tasting room. 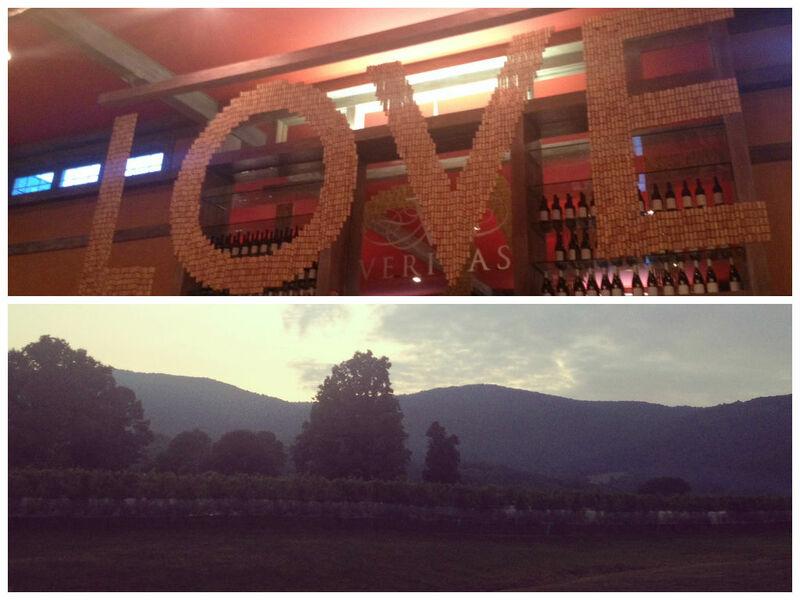 On a clear night, there is a beautiful view of the stars and moon above the vineyards. It was a bit of a cloudy day, but we still got a beautiful view of the sunset. This photo was taken while sitting on the grass underneath the patio/deck. Samples of fresh fruit are available in the store when I just want to buy a bag. My fav fruit I tasted the last time I came were the juicy, sweet white nectarines! Limited bathrooms – I’ve waited in long lines. I couldn’t hear the music as well in certain areas. They do not allow you to bring your own food, and I was not a fan of the restaurant because they quickly ran out of items and what I had (chicken salad wrap) was not flavorful. The wine is not made on the premises (although it is local), and it isn’t especially memorable. I’ve wanted to try out other outdoor concert series and vineyards, but these were the most popular with close drives to where I live. 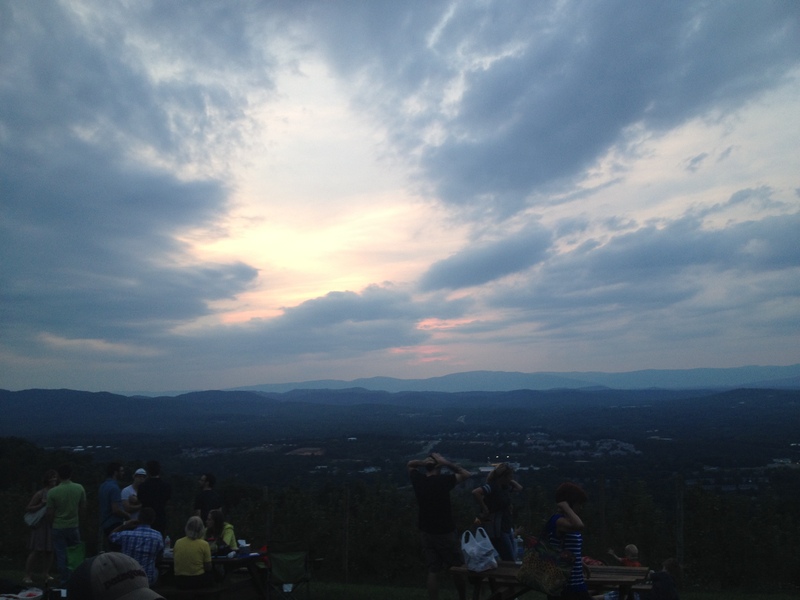 What are your favorite summer nighttime options in the Cville area?